To Martin Bakke on the "Ships starting with M" page. The Australian War Memorial has another picture of this ship, taken in 1940 (both links are external). Tonnage: 5484 gt, 3269 net, 8650 tdwt. Captain: Einar Hetland from 1936 until 1946. According to the Norwegian magazine "Krigsseileren No. 2 for 1997, this ship had a female crew member during the war, Johanne Emilie Larsen. She was at sea when war broke out in Norway, and had 5 children at home. She also served on Tamerlane, Tarn, Tamesis, Thorshøvdi, Fernglen, General Ruge, Brimanger, Kronprinsen and Havkong. A Guestbook message from someone whose father, Olav Schroder served on Martin Bakke before and during the war. Forum posting from a relative of someone who served as gunner on Martin Bakke, 1944/1945. He later served on Thalatta (his name is not given). Another forum thread - Re. John Royal Pitcher who's said to have served on Martin Bakke. Guestbook message from a relative of Billy (William) Steain, who served on this ship for a while. He died when K. G. Meldahl was sunk. July 30 Cristobal Liverpool Aug. 15 Independent Via Bermuda. Sept. 12 Liverpool   LG 1 Detached Sept. 14. Febr. 28 New York City Liverpool March 15 HX 228 10 Passengers. 1944 Jan. 12 Liverpool New York City Jan. 24 UC 10 Convoy will be added. March 26 Belfast Lough New York City Apr. 6 UC 17 Convoy will be added. May 29 Belfast Lough New York City June 9 UC 24 Convoy will be added. July 26 Belfast Lough New York City Aug. 5 UC 31 Convoy will be added. *Month should probably be May, and entry belongs further up in the record. Dec. 10 Milford Haven New York City Dec. 22 UC 48A Convoy will be added. Febr. 10 Liverpool New York City Febr. 23 UC 56A Convoy will be added. Apr. 2 Liverpool New York City Apr. 13 UC 62B Convoy will be added. May 6 Downs Antwerp May 7 TAM 160 See also Page 4. May 17 Southend New York City May 28 UC 68A Convoy will be added. From Page 1 of the archive documents, we learn that Martin Bakke was on her way to Charleston when war broke out in Norway on Apr. 9-1940. She had started out in Liverpool on Apr. 2, and via Belfast, she arrived Jacksonville on Apr. 17, proceeding to Savannah 2 days later, and from there to Charleston on Apr. 22, with arrival the next day. With lumber, lead and general cargo for Liverpool, she was scheduled for the Bermuda portion of Convoy HX 64 in Aug.-1940, but did not sail. According to the archive document referred to above, she left Bermuda on Aug. 6 and arrived Liverpool on the 15th, and A. Hague says she made this voyage indpendently. He later has her, with no voyage information, in a convoy designated LG 1, which left Liverpool on Sept. 12. Going back to the archive document, we see that she arrived Cristobal on Sept. 26, continuing to Tocopilla the next day, later heading to Brisbane, Sydney and Melbourne, then back to Sydney, where Christmas was celebrated. She appears to have spent quite a long time in New York early the following year. She had arrived there from Boston on Febr. 15-1941; departure is given as Apr. 17, when she proceeded to Table Bay, arriving on May 11, continuing to Mombasa 3 days later - again, see Page 1 (which also shows that she spent almost 2 months at Sandheads/Calcutta that summer, while she later stayed for over a month in Table Bay/Cape Town - see Voyage Record as well as Page 2). Skipping now to July-1942, when A. Hague has included her, together with Bajamar, in Convoy PG 3, leaving Cristobal on July 23, arriving Guantanamo on the 27th. 2 days later she's listed in Convoy TAW 8G from Guantanamo, which arrived Key West on Aug. 1. She subsequently proceeded to New York with Convoy KN 127 (with Kollbjørg), departing Key West on Aug. 5, arriving New York on the 11th. He also has her in Convoy UGF 2, departing Hampton Roads on Nov. 2, arriving Casablanca on the 18th, returning with Convoy GUF 2, which left Casablanca on Nov. 29 and arrived Hampton Roads on Dec. 11 - Martin Bakke arrived New York on the 13th. All these convoys are available via the external links provided in the Voyage Record. The voyage to Casablanca is not mentioned on Page 2. At the end of Febr.-1943 we find her in station 102 of Convoy HX 228 in which Brant County was sunk; follow the links for more details, several Norwegian ships took part. Cruising order/Commodore's notes, misc. reports and analysis of attacks are also available for this convoy. Martin Bakke had a general cargo as well as 10 passengers, and was bound for Manchester, where she arrived on March 17, heading back to New York on March 26, sailing independently. At the end of that year she's listed in Convoy HX 270, which left New York on Dec. 10 and arrived Liverpool on the 26th. This convoy is not yet available among the HX convoys included on my site, but will be added - see ships in all HX convoys; the Norwegian Elisabeth Bakke (Commodore Vessel), Heranger, Herbrand, Høyanger, Norholm and Washington Express are also listed. Martin Bakke's voyages in this period are shown on Page 3. In Jan.-1944 she's listed in the fast westbound North Atlantic Convoy UC 10*, which left Liverpool on Jan. 12 and arrived New York on the 25th. She returned to the U.K. the following month in Convoy CU 15, as the only Norwegian ship, bound for Newport with general cargo, arriving March 7. She now joined the westbound Convoy UC 17*, which originated in Liverpool on March 27 and arrived New York on Apr. 7, and in May that year she's listed in CU 23, returning to the U.S. with Convoy UC 24* - departure Liverpool May 29, arrival New York June 9. Later that month she shows up in Convoy CU 29, together with the Norwegian tanker Karsten Wang. Martin Bakke was bound for Manchester with general cargo and vehicles, and headed back to the U.S. again with Convoy UC 31*, which left Liverpool on July 25 and arrived New York on Aug. 5. The Norwegian California Express and Mosdale also took part. We now find her, again with a general cargo and vehicles for Manchester, in Convoy CU 36 from New York on Aug. 19. She arrived her destination on Aug. 31, later returning with Convoy UC 37*, which left Liverpool on Sept. 12 and arrived New York on the 23rd. Karsten Wang is again listed. Martin Bakke was scheduled to go back to the U.K. with Convoy CU 42 on Oct. 6, but did not sail, and does not show up again until Convoy CU 46 on Nov. 7 (along with Hegra). Her destination is given as Plymouth, where she arrived on Nov. 18. She rounded off that year by sailing to the U.S. with Convoy UC 48A*, together with Nordahl Grieg. This convoy left Liverpool on Dec. 8 and arrived New York on the 22nd. See also Page 3 and Page 4 of the archive documents - it'll be noticed that she often joined the westbound convoys from Belfast Lough or Milford Haven, rather than from Liverpool. 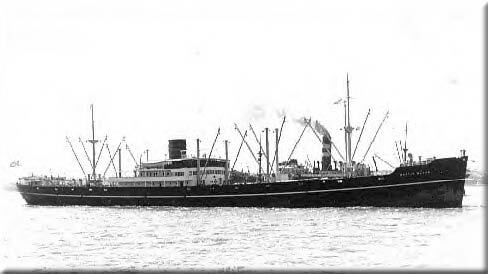 In Jan.-1945 she's listed in Convoy CU 55, along with California Express. Martin Bakke had a general cargo for Manchester, where she arrived Jan. 30, according to Page 4 above. She subsequently joined the westbound Convoy UC 56A*, again with Nordahl Gieg in company (departure Liverpool Febr. 11, arrival New York Febr. 23), and in March we find her, together with Finnmark, Hegra, Karsten Wang and Margrethe Bakke, in Convoy CU 62 to the U.K. She now joined the westbound Convoy UC 62B*, departing liverpool on Apr. 2, arriving New York on the 13th, then headed back across the Atlantic on Apr. 24 in Convoy CU 67, which also had California Express, Honningsvaag, Ida Bakke and Kirkenes in its ranks. Martin Bakke's destination is given as Antwerp on that occasion, general cargo, station 13, and according to A. Hague, she joined Convoy TAM 160 in order to proceed to her destination, with arrival Antwerp on May 7 (Jernfjeld is also listed in this convoy - ref. external link in the table above). He says she left Antwerp again on the 15th in Convoy ATM 155 for the U.K., subsequently joining the westbound North Atlantic Convoy UC 68A* together with Ida Bakke (convoy left Liverpool May 17, arrived New York May 28). Again, please compare the info in this paragraph with the details found on Page 4. See also Page 5 for further voyages (to Febr.-1946). * All the UC convoys mentioned here will be added to individual pages in my Convoys section in due course; in the meantime, the ships sailing in them are named on the page listing ships in all UC convoys. The escorts are named on this page. Ran aground on Nov. 30-1963 in River Scheldt on a voyage from Valparaiso to Antwerp. Refloated on Dec. 6 and taken in tow to Vlissingen, inspected and condemned. Sold in Dec.-1963 to Jos de Smedt, Burght for breaking up. Left Antwerp in tow on Jan. 11-1964, arriving Burght the same day for scrapping. Back to Martin Bakke on the "Ships starting with M" page. The company later had another ship by this name, originally delivered as Ventura in Jan.-1951 (Halfdan Ditlev Simonsen, Oslo), 5713 gt. Purchased by Knut Knutsen OAS in July-1965, renamed Martin Bakke. Sold to Arne Teigen & J. Hetland, Egersund in 1972, renamed Rytterholm. Capsized and sank on Oct. 12-1976 near La Corunna, Spain on a voyage Porsgrunn-Bangkok - 35 men saved, 1 lost. There's a thread about this ship on my Ship Forum. The text on this page was compiled with the help of: "Nortraships flåte", J. R. Hegland, "Krigsseileren", "Våre motorskip", Leif M. Bjørkelund and E. H. Kongshavn, and misc. (ref. My sources).